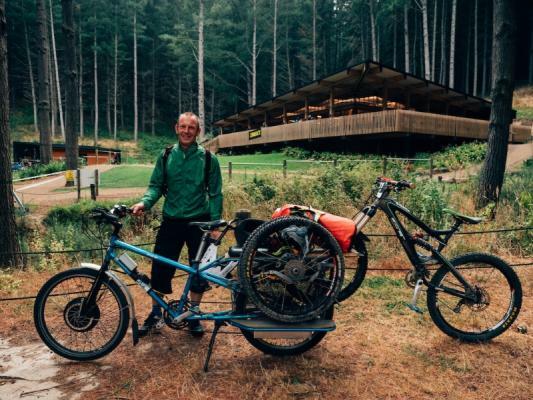 Bevan P, a self-employed Environmental Engineer from Christchurch, has the ideal form of race-day transport: haul your bike and gear across Chch to the Phoenix (Asia Pacific) Enduro on your cargo E-bike (he also made it to Pinkbike). No parking issues and 11th place in Masters! Photo credit to The Perfect Line. The 2010 GT Force race bike (the oldest bike in the field, and possibly the only 26" wheels) has custom angle headset, Rockshox Totem with 170 mm travel up front (new seals and Supergliss lube), Marzocchi Roco TST on rear running hot pink shock oil, for more consistent performance on those 10 minute flat out (for me anyway!) descents. Normal shock for trail riding is Fox RP23, serviced by Shockcraft with custom compression/boost tune. Normal trail fork is RS Sektor coil sprung with SKF seals, with RCT3 compression damper and Supergliss lube.